This beautiful quilt is perfect for your holiday decorating! Or anytime of the year! At only 30″ across — this pattern is the perfect weekend project. Make it this weekend and quilt it next weekend! The curves are gentle and Judy’s techniques and pattern markings make it easy! 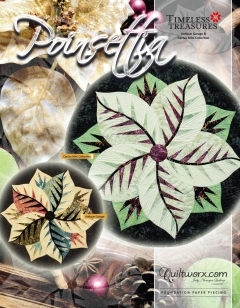 Bobkat Tip – Add the separate Poinsettia Fabric Kit below and you’re ready to go!